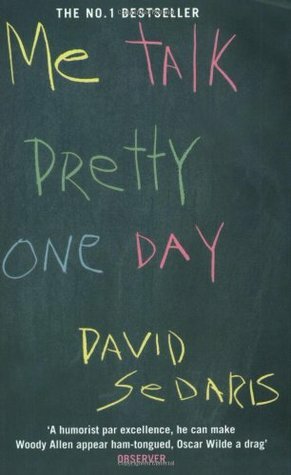 This entry was posted in Audiobook Review and tagged audiobook, book review, David Sedaris, humor, Me Talk Pretty One Day, memoir by Book Club Babe. Bookmark the permalink. I haven’t read this one but have also been considering it in audiobook format. I think I’m going to push this one really low on my list as I’m pretty sure the things that irritated you will also irritate me. Thanks for the honest review! Thanks! Glad I could help you prioritize your to-read list! I’ve never read any Sedaris, but I’ve always heard good things—but they were always vague things, like “he’s a genius” or “he’s awesome” or whatever. I don’t think I’d read any actual reviews of his work until now. And based on your review, I don’t think I’ll be reading him anytime soon. I have too many other books to read to deal with someone who sounds like a pretentious douche. Yeah exactly! I think he’s got a lot of fanboys/girls who blindly follow him, so he’s obviously polarizing. I’d say just pass on him if you’ve got other books to read!